Simeria is an ancient city that has been lost of thousands of years. Theres only a few of the Simerian tribe left but the world still has the same powers it did back in it's glory days! Explore the ancient temples and embrace the history this city has to offer. For rich players, the Antique Shop is where to stop! Items start at 10,000,000MP. Dig for free once every 24 hours to find rare Simerian artifacts. Complete the Simeria themed goals for a new prize at each level. Harpy rewards each of your pets for training their magic stats. Complete Hector the Collector's missions for a limited edition Ike pet. The Light Fairy rewards each of your pets for the University Courses they have completed. Spend your BP currency on these cute, collectable, magical Mummy Dolls. Open tombs to find MP and increase the multiplier - ends when you find a mummy. 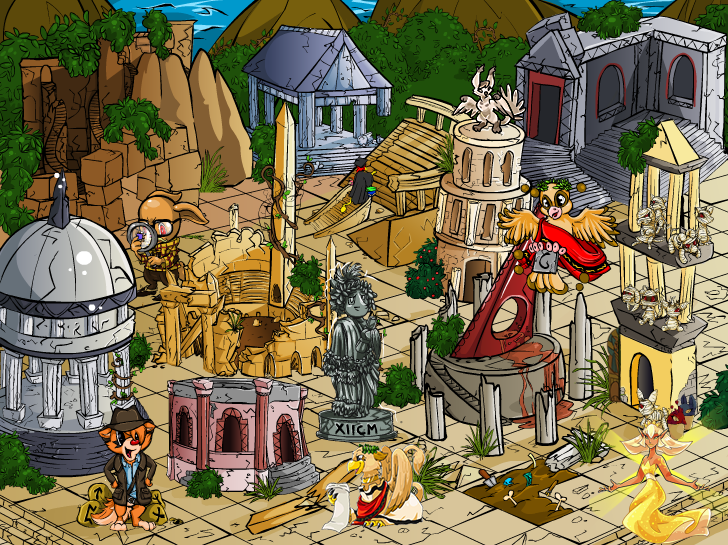 Complete the 30 levels of this temple for a reward at each level. Complete this temple to change your pet's species. Complete this temple to change your pet's costume. Bring the Simerian Excavator the items he needs and you may receive Simerian Slates. Bring the Simerian Explorer the items he needs and you may receive Runes. Visit the Simerian Statue once every 5 hours for 100MP and you may be rewarded. Sacrifice your pet to the Mean Fairy with a mummy doll and it may become a mummy! Your pets can continue their education at the University.